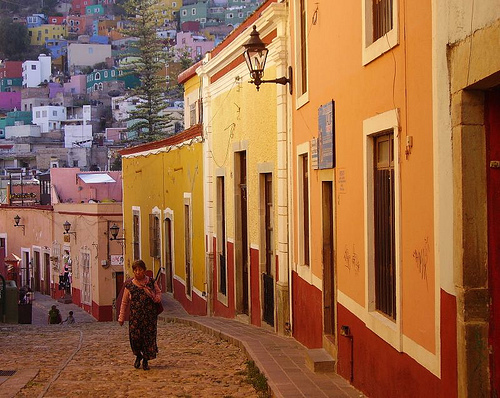 The state of Guanajuato has two great cities to visit, San Miguel De Allende and Guanajuato (the capital city of Guanajuato). Many of the city’s highways are partially or fully underground as Guanajuato is located in a narrow valley surrounded by tree lined hills. Most of the cobblestone streets are so narrow that cars cannot pass through and some roads are actually long sets of stairs up hills. The historic center of the city is filled with outdoor markets, colonial churches and mansions. The state of Guanajuato was formed in 1559 due to the number of silver mines in the area, some of which are open today for tours. 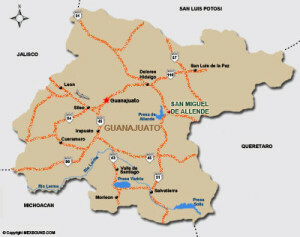 The mines that made Guanajuato rich are located both inside and just outside of the city proper. 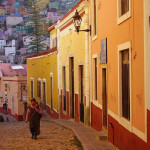 Guanajuato has 13 Hotels, 9 Hostels and 9 Bed and Breakfasts. Prices range from $6.00 a night at a Hostel to $294.00 a night at a 5 star Hotel. This amazing converted, 13 room mansion includes spacious rooms in neoclassical French design and includes original paintings by local artist Jesús Gallardo. Outside, various patios covered in exquisite, original tiles have everything from fountains and wicker chairs to Jacuzzis plus views of La Bufa. It’s in La Presa, a 15-minute walk from the center close to Don Quijote Iconographic Museum, Pipila Monument, and Juarez Theater. Nearby points of interest also include Union Garden and Plaza de la Paz. Recreational amenities include an indoor pool, a sauna, a fitness facility, and a steam room. The property’s full-service health spa has massage/treatment rooms. Complimentary wireless Internet access is available in public areas. The property offers a round trip airport shuttle (surcharge). For breakfast, try “El Midi.” This French run café is a great place to go for ambiance, a good cup of coffee and its fresh delights like tartes and croissants.. The salad bar starts at 12.30pm and á la carte meals are served in the evenings. “Yamuna” has a great range of vegetarian dishes with delicious Indian Hindu flavors. The prices are reasonable and the atmosphere is clean and nice. “Casa Valadez” is an upscale Mexican restaurant that faces the Jardin and Teatro Juarez. The servings are large and the prices are fair. Dishes dishes are a blend of international and Mexican. A great place to grab an early evening cocktail and watch the world go by is “El Cafe” located near Teatro Juarez. The outdoor patio with umbrellas makes a great place to sit and have a drink and a light meal. “Bar Ocho” is where the locals, expats and visitors go. This friendly, unpretentious place has seating inside and out, good music and snacks and a pool table upstairs. Held in the month of October, The Festival Internacional Cervantino is an annual cultural event, mostly held in the city of Guanajuato in more than 70 different venues. Artists from all over the world come for this event. The festival can last nearly a month and hosts events such as art exhibitions, concerts, dances, opera, theater productions and film showings. Events are held in area churches, plazas and on the streets. This tour guide service offers daily Guanajuato colonial tours, which include the Museo de las Momias, La Valenciana mine and church, the Monumento a El Pípila and the Carretera Panorámica. These depart three times daily, last 3½ hours and cost M$100. 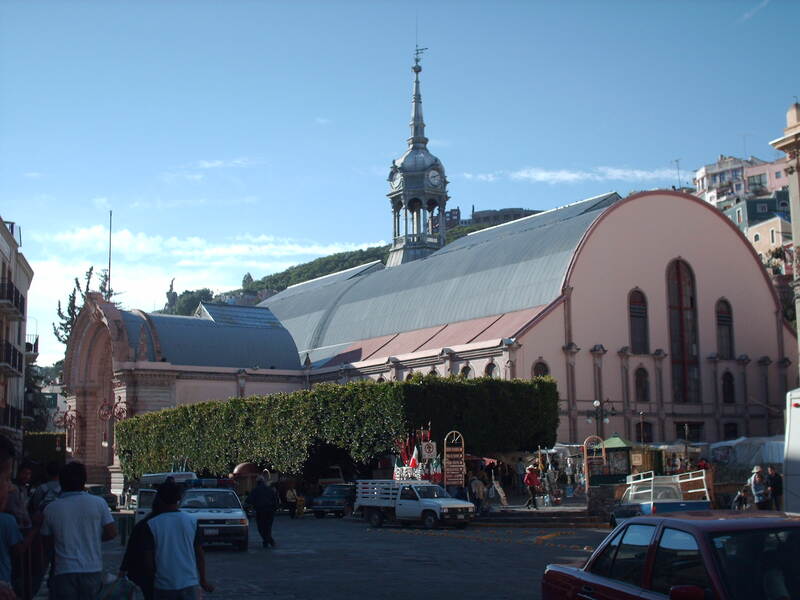 In the center of Guanajuato is the main plaza called Plaza de la Paz (the Plaza of Peace). Since the colonial period, the richest of the city’s families located their main homes amid the square. Today, many of these homes, or mansions, are still there but have been converted into government offices as well as stores. Still remaining around the plaza are mansions that belonged to local nobility such as the Counts of Rul, Count of Galvez, and the Count De los Chico. The Rul house was constructed at the end of the 18th century and is noted for its inner courtyard with architectural features from ancient Greece. The main church of the city is the Basilica Colegiata de Nuestra Señora de Guanajuato built between 1671 and 1696. The church has a Mexican Baroque style but there are elements from donations that speak to the city’s rich mining nobility. One of the best known plazas or open spaces is the Jardín de la Unión, on the south side of the San Diego Church. The garden is filled with carefully pruned Indian laurels and in addition to the church, is surrounded by small cafes, restaurants, and the Juarez Theater. In 1883, wrought iron benches and a kiosk were installed. Today, concerts are held in this kiosk and it is popular with wandering student musicians performing. 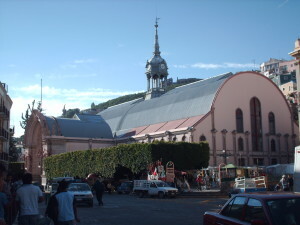 The Mercado Hidalgo was built in 1910 over what was the site of the Gavira bullring. Today, the market sells typical candies of the region such as “charamuscas,” which is often shaped as a charro or mummy and wrapped in wax paper. You can also find souvenir items such as knit items, ceramics, leather crafts, and other specialty food items. The Museo del Pueblo de Guanajuato was created to exhibit the best of the artwork of the city. It contains an important collection of religious art from the 17th to 19th centuries. The closest airport is Aeropuerto Internacional del Bajío, which is about 30km west of the city, halfway between Léon and Silao.